Pretty, powder pink rose quartz is THE gemstone when it comes to love, so I thought this would be a good time to feature it, with Valentine’s Day around the corner. Rose quartz is (obviously) part of the quartz family (which also includes, among others, amethyst, opal, and citrine) and comes in colors ranging from very pale, translucent pink to dark rose. Some have rutile needles which gives the stone an asterism effect, and you can find transparent stones as well, but they are much more rare, and so pale in color that you can hardly tell they’re pink. It is the State Mineral of South Dakota (where it is also mined), the alternate birthstone for January, and the alternate 2nd anniversary stone. It is believed to attract and retain love, and opens the wearer’s ability to give and receive love by opening the heart chakra. It is also thought to promote healthy, peaceful relationships, help heal emotional wounds and clear negative emotions (such as possessiveness, jealousy, and anger). It helps you forgive, trust and believe in yourself, and promotes calmness, love and peace. 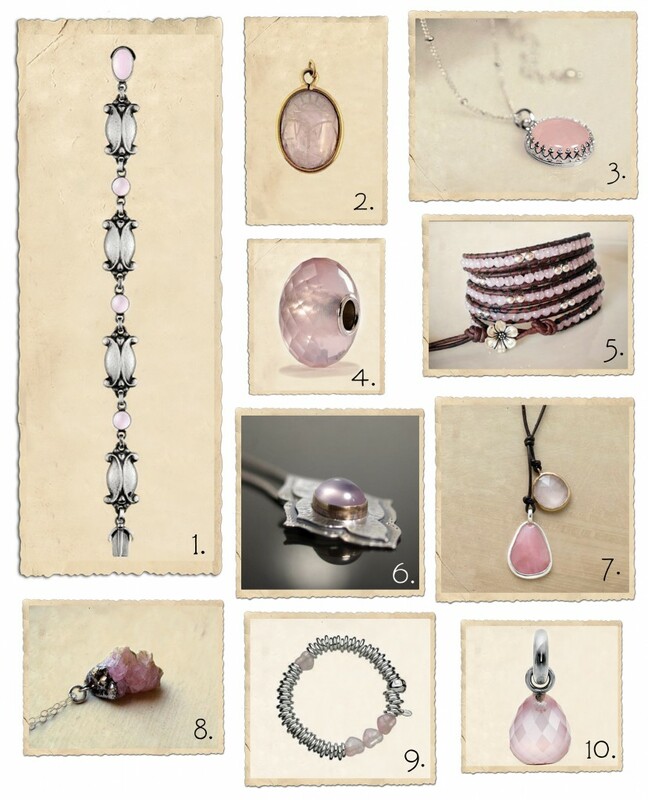 According to Crystal Energy Therapist Karen Ryan, when an expectant Mother wears rose quartz as a necklace or pendant, the baby receives loving, soothing and calming energy. It is also said to help with hormonal fluctuations and physical pain, both in humans and animals, and rumor has it that washing your face in water that has had a rose quartz in it will get rid of wrinkles and keep your skin young!